If you are a student, faculty, staff or alum, please login before continuing. This will allow you to access any ticketing benefits that you are entitled to. ArtWear is the annual juried exhibition of the graduating senior student work in the Fashion Design program in the UNT College of Visual Arts & Design. The 2019 fashion design seniors have dedicated countless hours day and night to produce their own unique collection to showcase their skills and talent after intense, rigorous training. 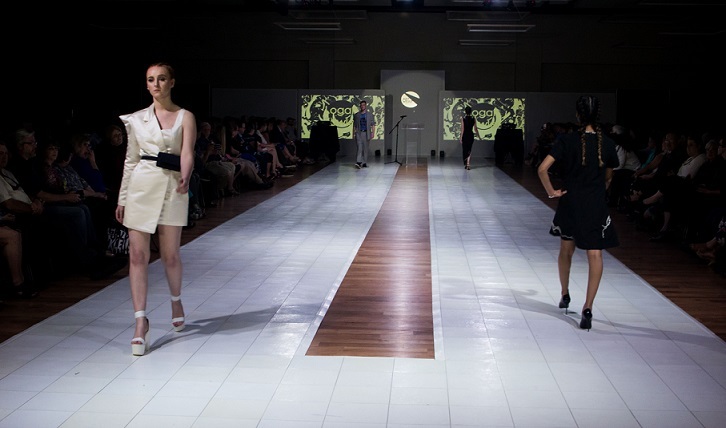 Each year the senior fashion students compete to have their best creations selected to walk the runway as they make their debut into the fashion industry. The ArtWear Fashion Event has a history of over 30 years and has debuted many successful young designers who have gone on to work for companies such as Calvin Klein, Liz Claiborne, Fossil,Theory, Nicole Miller, Betsy Johnson, Ralph Lauren, Perry Ellis, Monique Lhuillier, Dillard's, Haggar and JCPenney. Recognized alumni of the program include Michael Faircloth, Nicolas Villalba,Finley Moll, Shirin Askari, Khanh Nguyen, and Lucy Dang who are all successful independent fashion designers located in the southwest. UNT Parking Permit Holders: Please follow Transportation Services parking rules and regulations in regards to your designated pass. Non-UNT Parking Permits: Hourly public parking is available at the Highland Street Garage. The garage is located at the corner of Central Ave and W. Highland Street with easy access to the Union via the W. Highland Street entrance.